The outbreak of the Ebola virus in the Democratic Republic of Congo, fatal to over half of those infected, is worsening. There are now early reports that the number of patients has reached the threshold making the epidemic the second largest in history. With over 425 cases and 245 deaths, the epidemic in the DRC is a long way short of the many thousands affected in the West African outbreak in 2014, but it is widely acknowledged that we are still in the early days of the current epidemic. Resistance to the efforts of the WHO and partners has continued; at times coming from the local population, at others issuing from the several militias in the region. The city of Beni has received several assaults from local rebels. The most recent attack was targeted on the base of the UN peacekeepers, seemingly in response to a UN campaign on a rebel base earlier in the week during which several UN peacekeepers and Congolese soldiers had died. The attack in Beni took place near the Ebola Response Emergency Operations Centre and a hotel which was used by several WHO workers. There was even a report of a shell landing on the hotel where the WHO workers were holed-up – luckily it remained unexploded. Although none of the healthcare workers were harmed physically, 16 WHO staff were evacuated to Goma for psychological care following the traumatic experience. Once again, vaccination and follow up efforts were necessarily halted amidst further calls for UN peacekeeper provision to be strengthened. This episode highlights the possibility that the region might ultimately prove too dangerous for WHO staff. Some have commented on the possibility of what would occur should health workers be directly targeted by a rebel faction. At present, healthcare workers have been subject to local resistance, sometimes resulting in violence. However, should a concerted assault occur on WHO workers and partners, including kidnapping, then most fear that a complete withdrawal of ground-staff is a likely scenario. In that event, it seems inevitable that unbridled transmission of Ebola would result. No further vaccinations would occur; no quarantining of Ebola patients. Local burial rites, known to aid transmission of the virus, would be practised unchecked. As the cases of Ebola increased, infection of the pool of people displaced by rebel activity would be very likely, increasing the risk of transmission to the surrounding countries of South Sudan, Uganda and Rwanda. In this context, another epidemic approaching the scale of the 2014 West-African epidemic becomes possible. But the situation has not deteriorated to this extent as yet. It is true that one delegation of aid workers have been removed to the safety of the Capital, Kinshasa, 1000 miles away, with no plan to be redeployed. Other workers have to approach militia chiefs for permission before entering certain rebel-held hot spots in eastern DRC. Added to this, is the time restriction imposed by the curfews present in some areas, delaying some of the blood testing necessary to confirm an Ebola diagnosis. This is potentially important since receiving a positive blood test notification is the starting pistol to the whole Ebola prevention strategy, leading to quarantine, the establishment of a network of contacts, vaccination and follow-up. All events occurring as swiftly as possible to prevent further transmission. Last week a new intervention began, however, that may provide hope for this and subsequent Ebola epidemics. Four experimental treatments are being trialled in an Ebola Treatment Centre in Beni. Three of the novel medications are antibodies to various parts of the Ebola virus. The fourth drug acts in a different way. As its structure is similar to the building blocks used in the Ebola’s genetic information, it is hoped that Ebola will incorporate the drug whilst making copies of itself, rendering the newly produced viruses entirely useless. So far, 160 patients have been treated with these novel approaches. It is a sad fact that as the death rate from Ebola is so high, the efficacy of these untried drugs may be relatively straight-forward to establish. 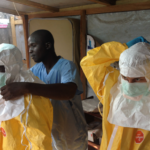 The main-stay of the Ebola response continues to be quarantine and vaccination. Even in these early stages of the outbreak, the scale of the work completed by the WHO is staggering. Almost 36,000 people have been vaccinated, 22,000 contacts have been identified and followed-up – 5,000 are still under active surveillance. Some people at risk of infection have been lost to follow-up, however, meaning that their whereabouts is uncertain and they could be unwittingly transmitting the virus to others. That most of these individuals come from dangerous, rebel-affected areas, such as Beni, is far from surprising. India’s first outbreak of the Zika virus was recently reported from Rajasthan, where around 154 cases were identified. A second epicentre of infection has now been established. The neighbouring region of Madhya Pradesh has reported a further 127 cases, although the actual number of infections is thought to be much higher. 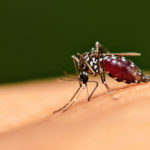 There has been debate in the Indian Press as to whether the Indian strain of Zika is capable of producing the much-feared complication of microcephaly – the devastating neurological condition seen in babies of mothers infected during pregnancy. Although it is unclear what the truth is, it has been established that the Indian Zika virus is very similar to the one found in Brazil. As the Brazilian Zika virus has increased the prevalence of microcephaly in that country by a factor of 25, there is fear that the Indian virus may be able to do the same. No cases of microcephaly in India have so far been reported. America has an on-going outbreak of an E. coli bacterial infection. Affecting 43 individuals from 12 states, 16 patients have needed to be hospitalised. As in previous outbreaks, the culprit has been found to be infected romaine lettuce – on this occasion from farms in California. So concerned is the Centers for Disease Control (CDC) that they have issued a recent advisory urging consumers and restaurateurs to throw out any romaine lettuce from certain growing regions of California, and all Romaine lettuce if its provenance is uncertain. Three outbreaks of E. Coli have occurred in the USA in the last two years, resulting in the deaths of six people. Last year’s outbreak, reported from Yuma, Arizona, was later identified to have been caused by a contaminated irrigation canal used to water the lettuces. The canal was found to run by a large animal feeding facility that provided effluent contaminated by E. Coli. Lettuce is particularly prone to bacterial infection that can be difficult to decontaminate effectively. 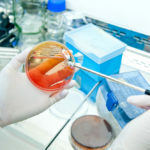 In an article entitled ‘How salmonella contaminate salad leaves – it’s not rocket science’, a team from Imperial College, London and Birmingham, have shown that the flagella on the organism (the tiny tails used to propel the bacteria) can flatten out, enabling them to actually cling onto the lettuce leaves, aiding replication on the salad and subsequent transmission. It is much the same with E. coli, which has been found to be similarly sticky to lettuce leaves, especially damaged ones. Lettuce irrigated with manure-contaminated water becomes colonised by the bacteria following their absorption through the plant’s root system, subsequently spreading to all edible parts of the plant. An unsavoury subject; but the Food and Drug Administration are holding public meetings to encourage farmers to reduce the risk of contamination to their produce, lessening the chance of the epidemic recurring again.